Digital marketing is of huge importance in today’s world and has been for some time now. The internet, smartphones and tablets have fundamentally changed the way that we do business and changed our shopping habits. A huge portion of shopping and research is now performed online, therefore it is important to have a strong digital marketing campaign in place. 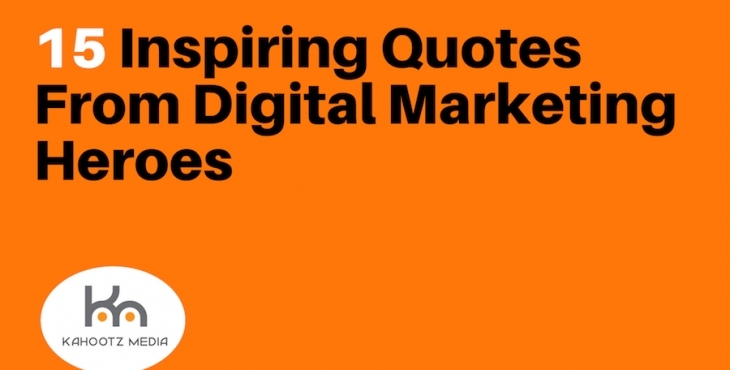 To help find inspiration, we have scoured the web and brought you 15 awesome quotes from our digital marketing heroes. These quotes are thought-provoking, but also practical and contain some superb advice. In years past, the emphasis was on closing a deal and making a sale regardless of the customer experience. This is no longer relevant, however – customers now have a huge array of options available to them, therefore you must give them a favourable experience and help wherever possible. Link building is an important SEO technique and a business should strive to produce a range of quality backlinks. This is not the only important consideration, however, and a business should also seek to build customer relationships. As business has shifted towards a digital medium; marketing is now shifting towards customer experience and involvement. It is no longer sufficient to simply market your products and how fantastic they are. You must be able to provide real value, and also entice your customers through the use of stories, metaphors and real-life situations. Creating content for the sake of content is never a good idea. In the past, it was possible to simply generate content to improve SEO – search engines today, however, are intelligent and look for quality as opposed to quantity. A headline is something that immediately grabs your customer’s attention – it is usually the first thing they will notice. Due to this fact, a header needs to be sharp, snappy and to the point – it must also have real value and relate to your content. This is fairly self-explanatory – content does not always need to be extensive. When browsing the web, users have access to a myriad of information – if they get bored of your content, they can simply open a new browser tab and move onto something different. Keep their attention. If you are not passionate about your business, how can you expect others to go above and beyond to help you? Your own passion, ethos and working ethic shine through in everything you do and reflect towards your staff. We love this simple and catchy phrase! In essence, content is the persistent element that generates the heat (i.e. generates exposure and sales), and social media is what ignites the heat and causes it to expand (i.e. shares your content with a wider audience). Basically, social media is a fantastic tool to promote your content and help increase your exposure. All forms of marketing are artificially contrived. What separates the good from the bad, however, is marketing that feels natural and doesn’t feel forced. There is nothing worse than watching a TV ad or seeing a website banner ad and knowing that the sole purpose is to generate revenue – it is such an obvious marketing ploy that it stands out a mile – try and avoid this type of marketing! During the infancy of search engines, Google cared mainly about your own content, backlinks and organic SEO. Today, however, there is a great emphasis on reviews, sharing and your reputation as a company. Websites who have fantastic reviews, and who have been mentioned favourably in other sources will often rank higher in Google indexes. Customer trust is hugely important in the world of digital marketing. It is much easier to sell to someone who trusts your business and brand. Work hard to create a bond with your customers – provide them with useful content and show them that you are invested in their interests. Don’t treat your customers as a number or a figure of revenue. This statement is simply fantastic and poignant – your content should be inspiring and boastful, but it should actually prove your worth. Digital content that is meaningless and shallow will yield poor results. Consider including statistics or reviews to add weight to your marketing – to show that you can deliver. How many times have you read an interesting article and thought “I wish I could share that with my friends!” only to be disappointed as there wasn’t an easy sharing option. Social sharing buttons can increase your exposure and help present it to a wider audience. Marketing can often fall short because it is unimaginative and boring. It is perfectly acceptable to try something different – push the boundaries, go against the grain and challenge common conceptions – use your imagination! Which would you trust more – a review of a business from a total stranger or a review of the same business from your friend? Use social media and sharing tools to your advantage and allow your content to be distributed through these trusted networks. We hope you have found these quotes inspiring and useful – we sure enjoyed compiling them. Digital marketing is a challenge, but with the right approach, determination and strategy, anyone can succeed. Kahootz Media – Outsource your digital marketing today!